Among such list, Bungee Jumping thrills the intrepid traveler to its ultimate rush. 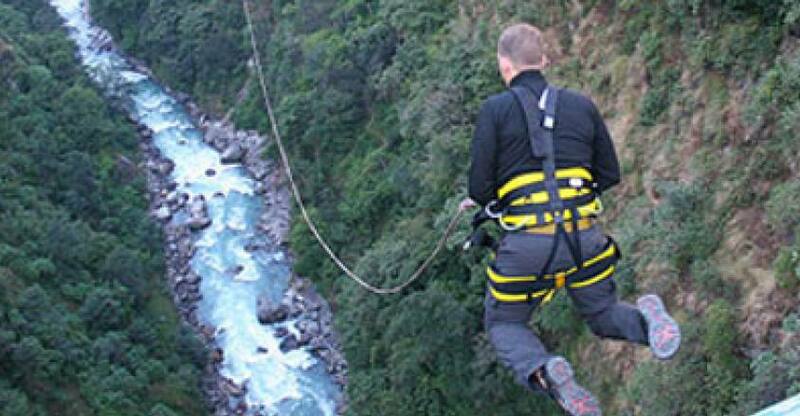 Nepal's first bungee jumping site is located 160m over the wild Bhote Kosi River. It is situated close to the Nepal-Tibet border, a three-hour bus ride from Kathmandu. This remarkable 500ft (160m) drop into the Bhoti Kosi River Gorge is the longest free-fall in the world and is also the most spectacular on the entire planet. The jump takes place on a 166m wide steel suspension bridge over the Bhotekoshi River Gorge. The bridge is Swiss designed and especially considers the safety of dive. We invite the bold passionate to join Halesi Treks one day trip to The Ultimate Rush to dive into the gorge of Bhote Koshi River. The bungee jumping experience in the fall will be beatable the unbeatable and remained spectacular.